PlayStation VR has opened the door for so many interesting ideas that wouldn’t be as fun outside of VR. 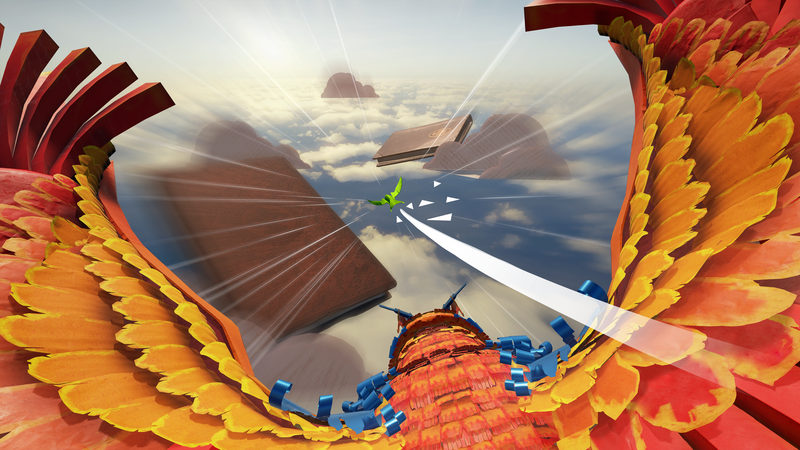 Developer Penny Black Studios came up with their own idea to make a game based around flying around interesting levels. How We Soar is the game and it is a beautifully well crafted experience that is perfect if you are looking for something to unwind with after a long day. How We Soar has a narrative to it even if it isn’t the most interesting or most in depth one. You basically hear the tale of a writer who is having some difficulties with writing his first book. 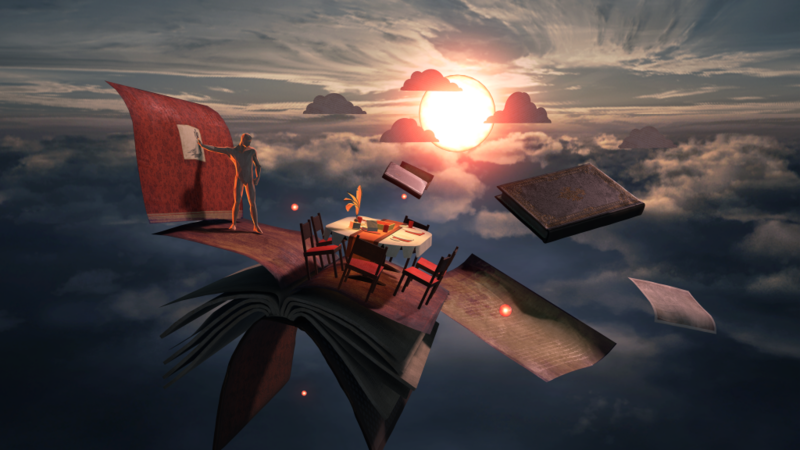 This basically is the basis of the game unfolding as you’ll fly around not as a phoenix but rather on top of one and open these pop up books around the various environments. The game is played with the Dualshock 4 only and you steer your direction by moving the sticks while the R2 and L2 triggers control how fast you go. Naturally the PSVR headset allows you to look around. I never once had any issues with these controls as they are smooth and responsive and helps keep you immersed in the experience. You’ll play through around a dozen levels that took me around 4-5 hours to finish. Each level has pretty much the same pattern to it as you’ll have to fly through hoops around each level that will cause the scene to unfold. Flying through all of the hoops in a level will spawn these colorful orbs around the level that you then can go pick up. There are various color orbs and when you collect all of one color it will cause a phoenix of that color to appear that you then are tasked with chasing down. Once you manage that you get some more story bits and then allowed to move on to the next level. A lot of the fun of the game is just flying around and painting each of these levels. As you fly around you are bringing color to the level you are in. Those pop up books come alive and have interesting effects when they do. How We Soar is one of the most relaxing games you can play and reminded me a lot of Flower back on the PS3. I came home one day from a long day of work and played a bit of it before going to bed and it really is the perfect kind of game to unwind with. 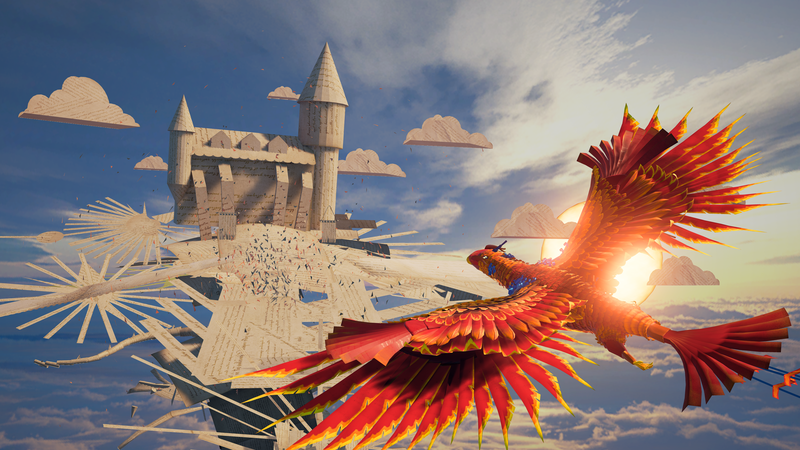 Now motion sickness is something that probably will come to your mind when you think about flying around on top of a phoenix. Thankfully while I did have a couple instances of motion sickness in some of the levels, for the most part it was smooth sailing. It never got to the point where I had to stop playing. The soundtrack of the game is just like the gameplay in that it is tranquil and relaxing. It just further adds to and helps complete that relaxing tone that this game oozes with. One of the only other knocks against the game is that once you finish it there isn’t a lot of replay value. No alternate modes or gameplay mechanics are unlocked so if you look for that in a game there isn’t much here. The only form of replay value is in the trophy system as the game does have set of them including a Platinum. To earn it you’ll have to color each level of the game completely which will take some time. I mentioned that it took me around 4-5 hours to beat the game but if you are going for all the trophies you’ll spend more than that as some of the levels are pretty big and would take awhile to fully color. 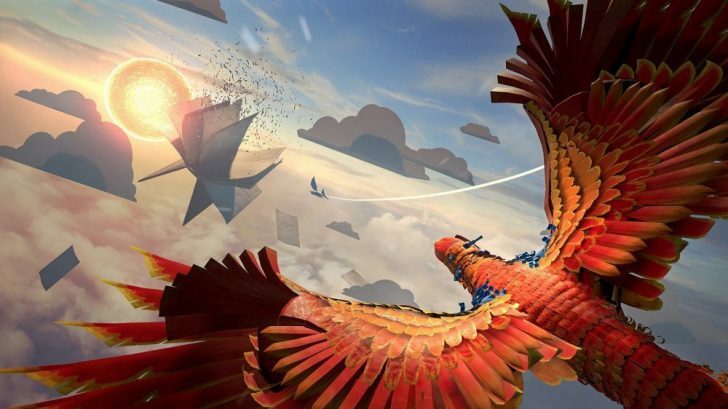 I can say that Penny Black Studios has crafted a beautiful, relaxing PlayStation VR experience in How We Soar. The game is built on an interesting idea that is relaxing under every layer that you unfold. Controls, gameplay, art style, and soundtrack all come together to form one of my favorite PlayStation VR games to date. I did have those few instances of discomfort but they weren’t bad enough to ruin this experience. 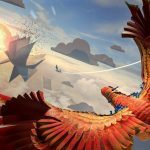 Add How We Soar to your must play PlayStation VR game list.